THE PAUW FOUNDATION HITS SUMMER GYM PRACTICE WITH CANMORE ILLUSIONS GYMNASTICS CLUB! Entering the large gym space – home to Canmore Illusions Gymnastics Club and so adequately equipped with hanging ropes, suspended rings. 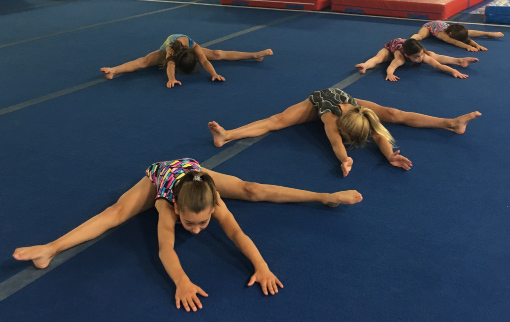 balancing beams, springboards, trampolines, and a floor covered with mats – we were greeted by a group of young gymnasts stretching, warming up and working through their conditioning exercises, for we were visiting during one of the club’s popular summer youth camps. Four of the gymnasts, all girls between the ages of eight and 13 – and all wearing fun, brightly-coloured, patterned leotards – were enrolled on the five-week Competitive Summer Training program, offered by the club every summer. Lead by Coach Ashley Pascos, the young gym squad were busy mastering their floor routine to Fergie’s Glamorous track; a sequence of strength moves timed to perfection and in sync to the beats. Coach Ashley explains that each of the girls taking part in the Competitive Summer Training Program would be spending three – five weeks of their summer holiday practicing various components of gym under her supportive wing and gentle encouragement to push their strength, agility and balance to the next level. Ashley then introduces the youngest of the group; a petit, eight-year-old gymnast named Leona. Leona has been with Canmore Illusions Gymnastics Club for a little over a year, and as we talk to Coach Ashley, she is practicing her jump and land technique on the mat, while some of her co-gymnasts are climbing the rope and swinging powerfully on the rings. It’s an impressive sight, a room filled with all types of athletic action as the young gymnasts show strength and elegance as they work on and around the equipment. The dedication and talent here is plain to see. we play games, and laugh a lot! Leona, as Ashley explains, has just returned from a family trip to Japan, where she trained extensively in a gymnastics club during her stay, noting that Leona “preferred the Canadian way to train, over the Japanese way”. Speaking of fun, the Club last month hosted their second annual Sleepover Camp, which took place between August 13-19th, as another component of their summer program. Headed up by Ashley, the intention with this camp is to complement gym training with a number of outdoor activities and group events, including rafting, paddle boarding, hiking, rock-climbing, a movie night, and a scavenger hunt. “We do lots of gym of course, but we do so much more on the Camp – it’s nice we can try other things and enjoy different activities too,” Ashley says. Ashley is delighted with the response to the club’s latest summer camp addition. 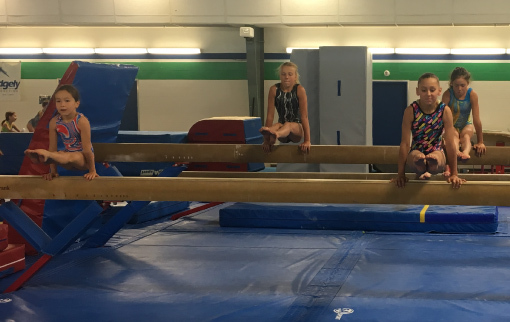 For the first year of the sleepover program, the club received 37 sign-ups, and due to its success, this year saw 44 registrants – with some gymnasts travelling from different parts of Alberta, B.C. and even as far as The Yukon to take part! Ashley tells us that the club also awards one scholarship for one young person to attend the Sleepover Camp, with the recipient this year being an enthusiastic gymnast from Three Hills, Alberta. “She is a total go-getter, and if she had a facility such as ours to train in regularly, she’d be a real competitor,” Ashley says. As we get to know Coach Ashley a little better, we can see why she has followed a path into coaching gymnastics. Growing up in Ontario, Ashley was a keen gymnast herself, training from the age of seven. After spending two years studying sports coaching at a college in Toronto, she moved West and has been a full-time coach at Canmore Illusions Gymnastics Club for the last two years. Currently, Ashley is taking her Level 4 coaching course [the highest a coach can train to]. We’re already impressed by this, before she informs us that only eight coaches from across Canada are accepted into the teaching program every year. To broaden her coaching experience and understanding of different approaches, Ashley last year travelled to China to spend two weeks with the National Training Centre. Earlier this summer, she visited Romania to do the same. Safe to say, these young gymnasts are in very capable hands. Alongside Ashley, the club is also supported by Jordana Drukarsh, Kelly Mock and Keenan Pascos, who coach the competitive groups (girls and boys) groups throughout the summer, and Aundrea Dube, Kindrey Dy Nys, Anna Parent, Rianne Hambly, Tatsuo Okuma, Skylar Belczyk, Tori Kelly and Lindsay Bischoff – who assist with coaching the recreational groups. Maiysha Glaude coached the preschool group of the summer camp. The club also hosts a trampoline camp as part of their summer programming. As one of the Pauw Foundation 2017-18 Youth Sport Fund clubs, Canmore Illusions Gymnastics Club has been committed to the young gymnasts of the Bow Valley for over 20 years. It was the club’s former Head Coach, Marti Przibislawsky, that started an after-school gymnastics program at Elizabeth Rummel Elementary School in January 1994. Just one year later, a small, pre-competitive group started to use the gymnastics facilities then available at the Canmore Recreation Centre. In September of 1996 a Parents Committee was then formed and the club was registered – and the rest, as they say, is history. With the funds donated to the club from the Wim & Nancy Pauw Foundation, the Club has purchased a new pommel for the facility.